Baler is a popular surfing destination in the Philippines. It was identified by Google in 2009 as topping the list of beach destinations in the country. It was described by Yahoo! Southeast Asia in March 2013 as one of the "top surf spots" in the Philippines (source WIKIPEDIA). My college friends are always asking me if we can visit Baler. Honestly, Baler is my last option for our out of town trips. The first time I visited Baler, I'm not impressed. It's just like an ordinary beach. The sand is not pure and white. The water is not clear compare to white beaches in the north ( Like in Zambales and Ilocos Norte). Baler is a surfing haven. If you want to see great waves and want to learn surfing, this is the right place. It's approximately 7 hours away from Manila. 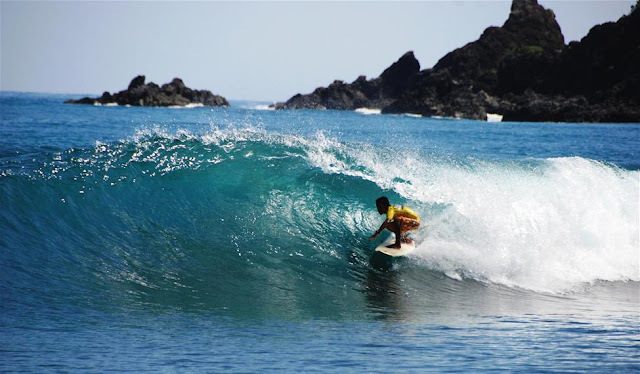 Sabang Beach is the most popular where you can see novice and seasoned surfer around the beach. There are lots of surf shops and schools that cater the needs of surfers and to those who wants to learn surfing. Aside from the beach, you can also enjoy the place with their historic spots, other natural wonders and other man-made attractions. To maximize our experience in Baler, I need first to do some research about Baler, where to go, what to eat, what to do, what to wear and the most important is where to stay. I saw a lot of blogs and surprisingly, most of them are my blogger friends. Some of them really enjoyed their surfing experience. I already purchased our tickets in Genesis.The bus terminal is located in Cubao. Since it's a long hour travel, I decided to get JoyBus instead the regular air-conditioned bus. The fare is Php700/ one way. Finding the best accommodation is always my opportunity. I know my friends are not delicate and they can stay whatever I choose. They are cowboys. This is their first time to visit Baler and I want to provide them the best. I want to make sure their Baler experience will be memorable. There are beach-front resorts offer comfy rooms yet expensive. There are resorts offer affordable rates which is 15- minute walk away from the beach. You need to walk or ride a tricycle before you can reach the beach. Haissssttt... sometimes planning is a bit stressful. There are so many things that go inside in my mind and I don't know when to start. To get more details on our "Baler Adventures," watch out my post on this blog.